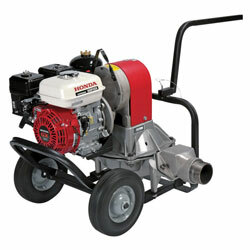 This heavy-duty 3" diaphragm pump powered by a 4 HP Honda OHV commercial-grade engine. Honda Diaphragm Pumps offer exceptional durability and performance with features such as special rock channel and spring loaded connecting rod that prevents damage from sediment buildup. Dimensions 32.5" x 23.4" x 25.0"